On this beautiful sunny afternoon do we dare say…spring is coming? (Note: we whispered those words). Well, if not spring, then certainly Easter showed itself as our little KinderBunnies participated in all things pink, yellow and purple. Although it’s a little early to start talking Easter, we had several requests that the Easter Bunny make a short appearance in the classroom. And who are we to turn down a sweet opportunity? Especially when it involves jelly beans and chocolate. It was a bit of a potpourri as we were winding down some of our projects. 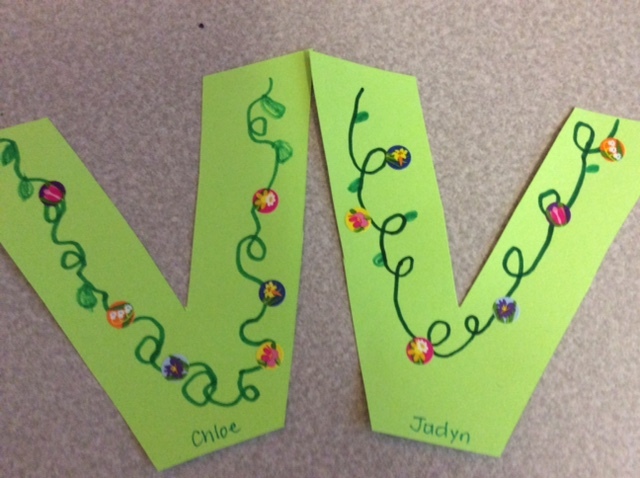 Here is our gorgeous “v is a vine.” We’re getting close now to the end of the alphabet! 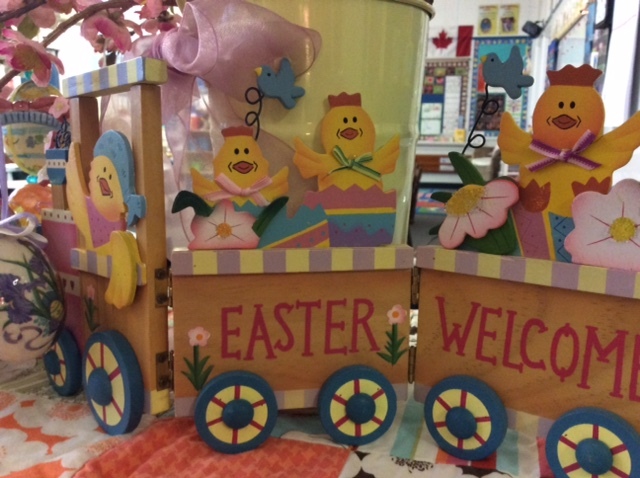 We completed a myriad of Easter crafts like our bunny baskets with our Grade 7 Buddies. We had a mini-Easter egg hunt (one egg with goodies inside) and a task to complete as well! We matched the letters that were hiding in the eggs to a cute Easter colouring page with a special message. 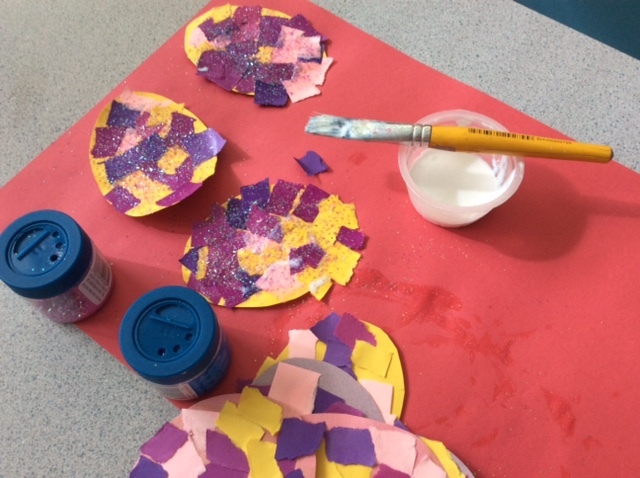 We also made torn paper eggs decorated with sparkle mod podge and layered with pink and purple sparkles. The children really love to make crafts and this makes a huge difference in developing their fine motor strength and control (very important for printing, drawing, colouring, cutting and pasting). 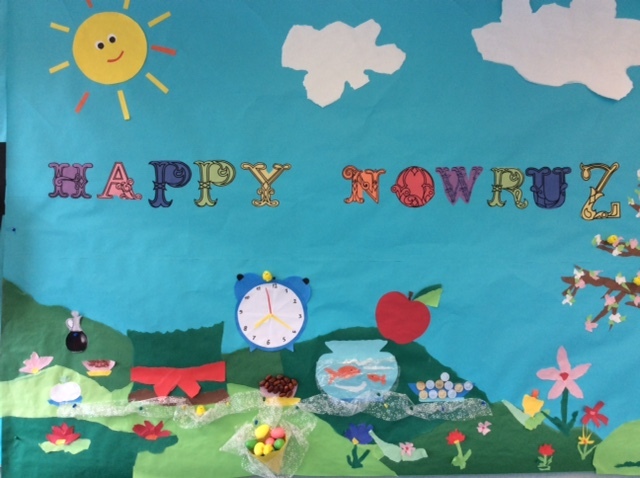 Wednesday was our opportunity to visit the Nowruz display to celebrate the Persian New Year. We were able to view beautiful Persian artifacts in our glass cabinet and the haft seen table. 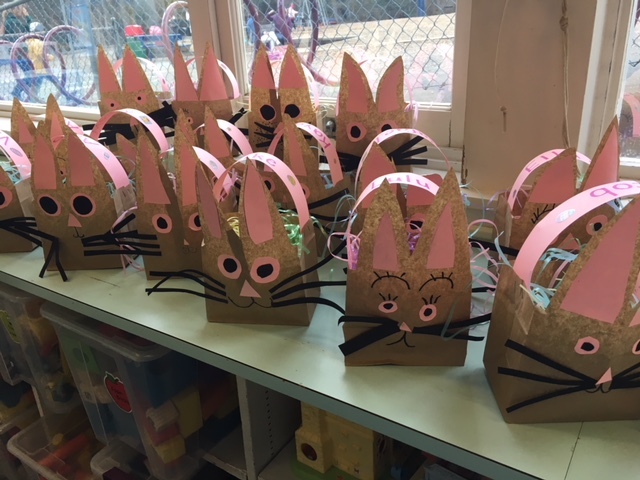 Thank you to our hard-working parents for explaining the significance of all these objects, and for making the pretty treat bags for all the students in the school! Our children were extremely good listeners and were able to remember many facts from the short video they watched in the Library. 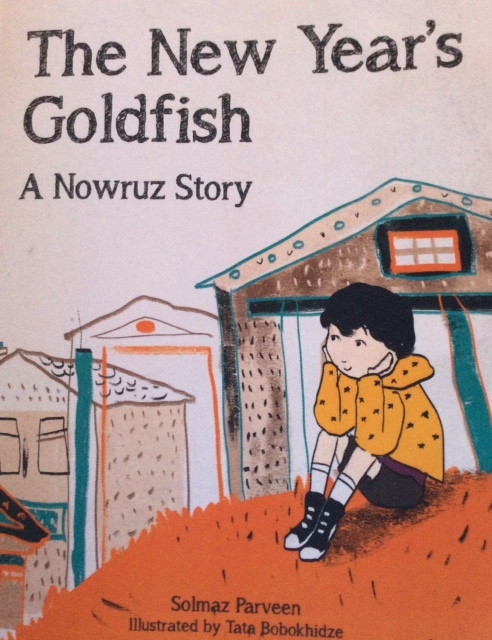 Mrs. Kennedy also read us The New Year’s Goldfish, by Solmaz Parveen and Tata Bobokhidze. With a few students away in each class, Christy and I decided to put both classes together for Thursday afternoon and Friday morning. We had so much fun! You might remember that Christy and I use to job-share (50% each of the teaching week) so we have a great teaching synergy with both of us in the classroom. First, we started off with the hottest ticket in town…Kindergarten lunch with all the children in my room! We actually had enough chairs! Joined by four Grade 7 monitors, our lunch time supervisor and the classroom teachers, the children thoroughly enjoyed the social time of eating and chatting with their friends. It was actually not too loud…..
After playtime, we all gathered together again for an Easter story, The Chocolate Rabbit by Maria Claret. It’s the story of little Bertie Rabbit and how through a chocolate mishap, his father (a famous Easter egg painter) comes up with the idea of making chocolate rabbits for Easter. Next, we made wax crayon resist Easter eggs, with a focus on line, shape, patterns and following teacher directions. 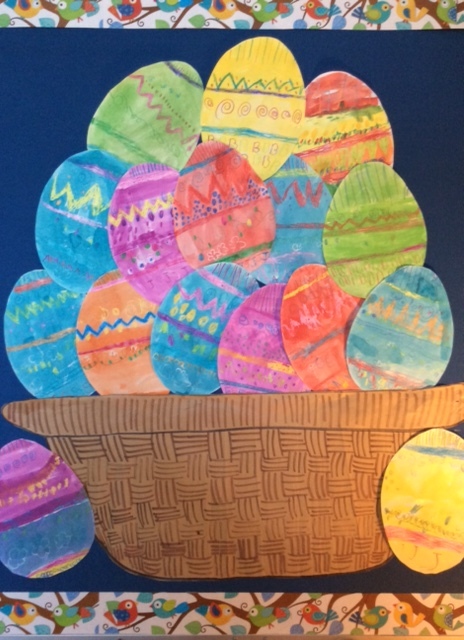 We gave our eggs a paint wash with tempera paint pucks and then filled our Easter basket! This morning we all gathered in Christy’s room for a fun time with Centres! It’s important we continue to foster the friendships and connections between all the Kindergarten children. We want the children to get to know everyone in Kindergarten, maintain their friendships with friends from preschool while making new friends as they move along through school. Happy Easter to all of our little bunnies and we will see everyone back at school on Tuesday, April 3!